Many people struggle with connecting with others and developing meaningful relationships. Instant Friendship: How to Make Friends Instantly! by The INSTANT-Series is a useful tool that will give good guidance when it comes to making friends easily. 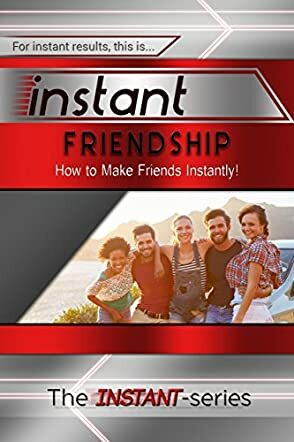 The tips and techniques shared by the author will help in determining the current status of making friends, how to convert the first meeting to friendship, and how to maintain friendships once they have been made. The Value of Friendship suggested in the book will make everyone realize that it is high time we learn to make friends. Let us begin to make new friends and maintain the friendships by reading this book! The author’s concept is simple and easy to practice, and will help readers pay attention when they meet people. I like the author’s methodical way of putting down the steps when it comes to moving forward after meeting new people, where to look for friends, the presentation and the approach. They are all helpful to readers. For all those who have been feeling trapped in their spaces, without having proper company to hang out or socialize with, this book is a must-read. The topic is refreshing and relevant to everyone. For introverts, this book is a must-read as the progression to friendship is made easy by the guidelines shared by the author. The exercises in the book are also very helpful to make note of how the progression is working. So what are you waiting for? Go out and start making friends!! Instant Friendship is the second book in the INSTANT-Series that I have had the pleasure of reading. I have often thought that I am a good friend, but I put it to the test—literally—by taking the Friendability Level Quiz in this book. With 5 quick questions, I learned that I have some things to work on. This easy read at approximately 40 pages begins with people’s inherent need for friends and the value in that. Do you have trouble maintaining friendships? I do and I always chalked it up to someone else not doing their part. Or thinking that life just got in the way, people grow apart, etc. After reading the author’s breakdown on friendships, I realized that it’s deeper than that. Instant Friendship takes you back to the basics: Meeting People and Establishing the Friendship. Where and how you meet people sets the tone for your friendship. Do you have common interests? Do you know how to contact each other outside of social media? Which is another component of friendships these days that exists: meeting people online. Not for dating purposes but to locate networking groups. Each chapter of this book gives you exercises to try so you can get into friend-shape. Yes, that is a thing. I gained some valuable insight that made me reflect on the origin of some of my friendships. My favorite chapter is Keeping the Friendship. This is where I learned the most about what I am lacking in my friendships. The author talks about how friendship is a two-way street. You must keep in touch, listen, compromise, and realize that everything is not all about you. The summation of Instant Friendship comes with Chapter 7: Landing the Friend Ship. Even if you think you are a great friend and/or skilled at building friendships, you will still benefit from the content. There’s no harm in enhancing a good thing. More importantly, people who are inept at making friends due to shyness or social awkwardness will gain knowledge from the real-life situations shared in this book. As a lifelong ambivert, I have admittedly had a difficult time making friends. I find social settings to be awkward and intimidating and although I can hold a conversation about pretty much anything, it never seems to naturally develop into anything else. I have frequently met others with whom I'd longed for a deeper connection, but I was utterly clueless as to how to grow those relationships and become friends. Instant Friendship seeks to address the plight of those of us who have struggled with this seemingly impossible task. First, it helps to identify why you have a hard time making friends (do you not put yourself out there? Do you not know where to find people to connect with?). I am a bit standoffish and prefer to take in situations as opposed to putting myself out there. Obviously, not a great recipe for drawing people in. This book truly taught me to allow for opportunities to develop by creating them myself. Instead of being so closed off and expecting other to flock to me anyway, I have to look for chances to let my freak flag fly, so to speak, and be myself. I'm naturally more drawn to the Internet than in-person connections because I'm a stay-at-home/work-from-home mother of 2 and Instant Friendship helps in that regard, too. Instead of just spilling the same advice (open up, talk to people, etc. ), it provides specific ways to break the ice canned move from acquaintance to relationship and, most importantly, how to maintain that friendship once you have it. Although making friends in the first place can be difficult, making that friendship last is an entirely different beast with its own challenges. Some advice offered within the book is to proactive and be the type of friend that you want to have. This advice was absolutely invaluable. I was able to immediately enact it with a woman I just met and I would instantly tell the difference that it made in our relationship. Making friends always seemed to come naturally to others, and now, it actually seems to be a bit second-nature for me, too. I'm not suddenly a social butterfly, but I have made a couple of great connections that I otherwise would not have. Tips offered in this book were very promising The first chapter "Growing the Tribe" I thought was quite clever. This book gives insight on the values of friendship and how to make great, long-lasting friendships, rather than ones that die off quickly. It also helps you to be less nervous about approaching others and starting conversation so you can actually make friends. Maybe you are someone who also has social anxiety, or finds it hard to approach others like me. I think this book can actually help other people. This even gives insight on meeting online friends which I found to very interesting, since I do play a lot of social games. My favorite chapter had to be "Exploding the Social Life" The name of it alone is great. It explains how to show your more interesting side to others, which "outweighs" most other traits. So basically, I would recommend this if you are looking for something to help you out with being more social, and making better lasting friendships with others. Love it! This isn't my first time reading one of the Instant Series, so when I bought this one I had some pretty high expectations, and the book didn't disappoint. The book brings up several points on how to make friends, as well as a couple of chapters about keeping them. It discusses ways to catch people's interest (there's an entire section on how people love to be entertained and how you can use that), how to make conversation without being too shy or too desperate, how to ask for contact information without seeming invasive (which, if you're anything like me, is terrifying--at least, until this book really simplified it), and even offers loads of advice and steps on how to act after the initial meet. One thing I liked was that the book brought up meeting friends online, which is a very big reality these days. What's more, the book was very practical about it--if you want to make friends through the internet, it's absolutely possible as long as you're willing to put in the work to turn it into an offline friendship, too. The book is really packed for tips for all sorts of situations: it teaches you how to be a host/hostess (and why that is a fantastic way to make friends), how to make friends at parties or work or elsewhere, and how to practice and train your conversation skills (this was something I especially found handy, since this is usually one of my biggest problems in being social). There were a couple of instances near the beginning of the book where the tone could seem a little harsh at times, but let's be honest. Anything that just pats you on the back and tells you that you don't have to make any changes isn't going to offer you any substantial advice (*cough* Wikihow *cough*). If you're interested in buying this book, you have to be willing to acknowledge that friends won't just gravitate toward you. You have to be willing to put in some effort and make some changes in your life, and if you're willing to admit that, then this book will guide you the rest of the way. That being said, while the book was really straightforward, the author did definitely have a sense of humor and a personality. There's a good amount of sarcasm ("Do you remember the last time you were out and could not wait to befriend that person with ripped-up worn-out clothes and a dirty face?") as well as a lot of friendly quips and interjections ("Soon enough, you will be exceeding your text messaging allowance and paying overages! A great problem to have!!!"). I only bought the book a couple of days ago, so I haven't had the chance to test out too many of its methods, but they definitely seem achievable (which is a relief) and they make enough sense that I definitely can see them working. If you're looking for a good, straightforward guide with all the tools and steps and perspectives, I'd DEFINITELY recommend this one.